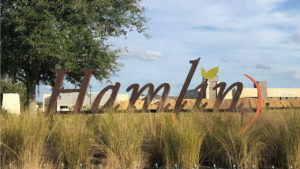 Hamlin is located on beautiful Lake Hancock. This area will be the destination hub for the entire region with shopping, dining, entertainment, offices, hotels, medical facilities (Orlando Health Winter Garden emergency center, opened Summer 2018) and education with Valencia College building a new campus. Hamlin will have nearly 2 million square feet of mixed use commercial space. This area will be the destination hub for the entire region with shopping, dining, entertainment, offices, hotels, medical facilities (Orlando Health Winter Garden emergency center, which opened Summer 2018) and also education Valencia College will be building a campus. Cinepolis Luxury cinemas opened its doors August 2018. Just announced – The Hamlin Market a 16,000+SF market on Lake Hancock offering dining and retail shoppes. Development will offer a rooftop bar on second floor and outdoor seating. Construction is set to start early second quarter 2019.